Adam Elements, a leading smart lifestyle solutions brand, is excited to announce the launch of its iKlips DUO campaign on Indiegogo. 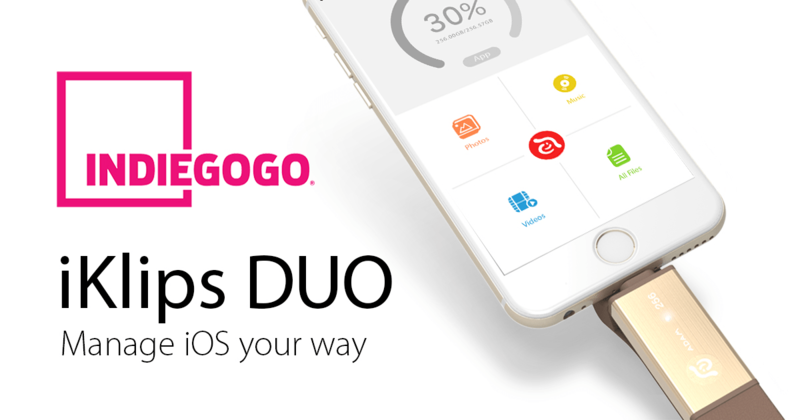 The iKlips DUO is the latest version of the iKlips, which was successfully launched on Indiegogo in the previous year. Following in its footsteps, the new iKlips DUO revolutionises the way in which you manage your device and content on the go. The DUO is not only faster and more robust, but also comes with the intuitive iKlips 2.0 app that allows you to organise your files, share them across all your devices and use them on the go as you like it. With the new iKlips DUO, it’s iOS your way. If you became attached to iKlips the first time round, you will love what we have in store with the new iKlips DUO. It is a design that has been perfected to be more practical, with a redesigned body to fit even more iPhone and iPad cases and a silicone body sleeve for added protection. Losing connector caps is now a thing of the past. Available in four vivid colours and four storage capacities, iKlips DUO provides you with the necessary extra storage to keep your photos, music and games organised on the go. Like the first iKlips, the new iKlips DUO is also produced with top-quality and super high-speed MLC flash memory for iPhone, iPad, and iPad Pro – the fastest flash memory type for iOS devices. In addition to enabling greater speeds, it also provides greater stability and a longer lifespan. 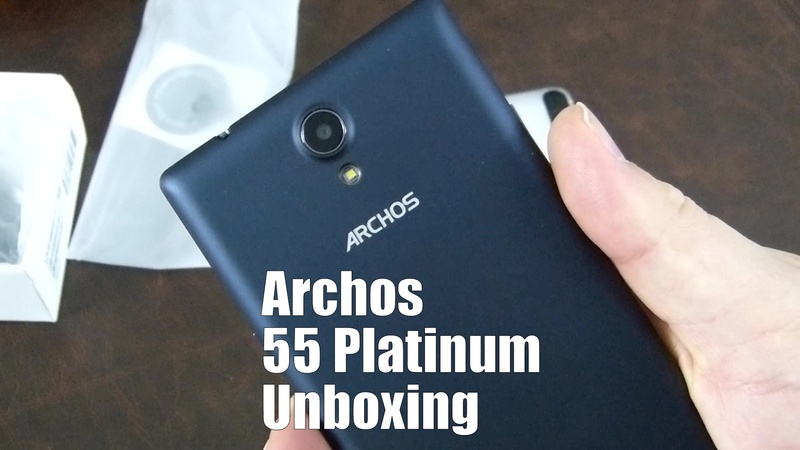 And with its gorgeous high-grade aluminium body, you will want to use it as often as possible. It is gorgeous to hold and use. iKlips 2.0 is the other half of what makes iKlips DUO even better. It is an intuitive app that makes using your iKlips DUO an even easier experience, featuring 3D Touch support, multi-select, Split View, password protection, Drop To, and even integration with Apple’s Music app to access your iTunes purchases. Now all your music, photos, videos, work projects, Adobe files, and all your other creations can be securely shared between devices – iPhone, iPad, iPad Pro, Mac, and PC. Having the ability to organise, store more and share on the go with friends, family, and colleagues gives you the power to do more. iKlips 2.0 is the way you want to manage your device – easily. Last year, iKlips was launched in Indiegogo and reached 425% of its initial funding goal by April 2015. This year, Adam Elements plans to repeat this success with the launch of its iKlips DUO campaign. In the hope to reach more people, a successful Indiegogo campaign will help to bring iKlips DUO to the market quicker and cheaper and determine whether to commit iKlips DUO to mass production. Once this goal is reached, more people will be able to enjoy the benefit that it brings to managing content on the go. 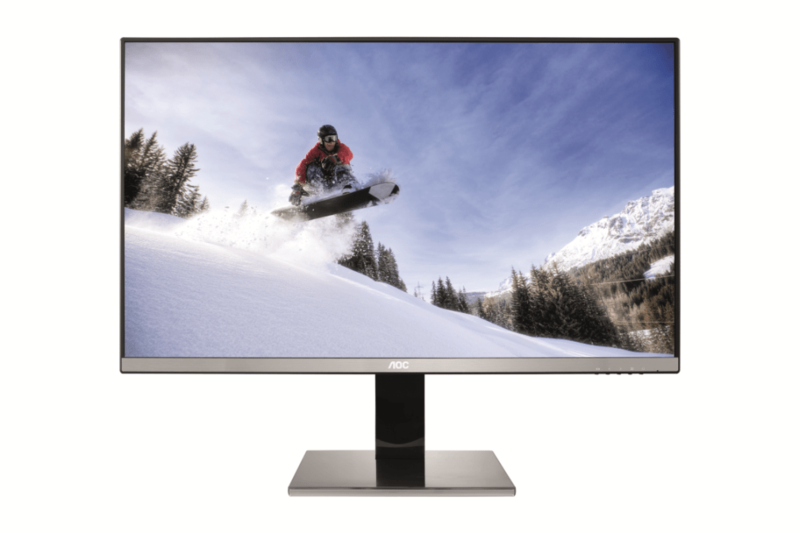 With their new 75 Series, AOC presents a new selection of energy-efficient 16:9 widescreen monitors for its professional customers. The stylish, comprehensively certified displays will be available in various sizes ranging from 18.5″ to 27″ (47 cm to 69 cm) at its largest, making the monitors suitable for different working environments. Users can select between a variety of high quality panels (IPS, TN) and will also benefit from the integrated Flicker-Free technology, ensuring comfortable viewing even during long periods of working. The 75 Series thus caters to various needs, making it an ideal addition to workplaces of all kinds. 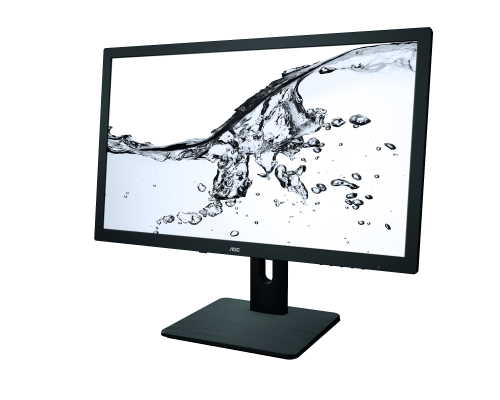 All monitors in the 75 Series come in an elegant, clean design in matte black and, with VESA wall mount compatibility that makes it possible to easily attach the displays to a wall, thus allowing for a versatile usage across different office settings. The monitors can consequently be utilised for public presentations, but also cut a fine figure at the workplace. Furthermore, each display comprises integrated stereo loudspeakers, meaning that users do not need to add extra clutter to their workstation. All monitors boast high quality panels (IPS, TN) and, excluding the E975SWDA and the Q2775PQU, also come with Full HD resolution. Particularly the I and Q models of the series impress with their IPS-panels, enabling colour uniform images and wide viewing angles. A highlight of the series is the Q2775PQU, which offers QHD resolution (2560 x 1440 pixels) and thus enables users to enjoy particularly crisp, detailed images as well as a more spacious desktop. 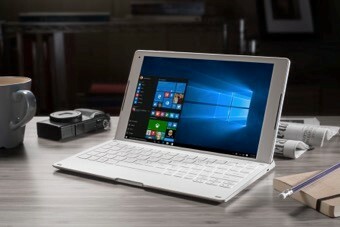 It also allows for superior multitasking, being able to display four application windows with 720p resolution each at the same time. All models – with the exception of the 18.5″ model E975SWDA, which does not have HDMI – comprise VGA, DVI and HDMI inputs for connecting a variety of either digital or analogue sources. The higher models further encompass DisplayPort and USB 3.0, with the latter allowing users to easily connect USB peripherals. A fast charge USB port also empowers them to charge their mobile devices’ internal batteries extra-fast using the monitor. The main digital connection cables (DVI and DisplayPort) are included, so that users can get right to work. In a modern working environment, energy-efficient technology is of upmost importance to businesses who are interested in operating in a sustainable and cost-saving way. 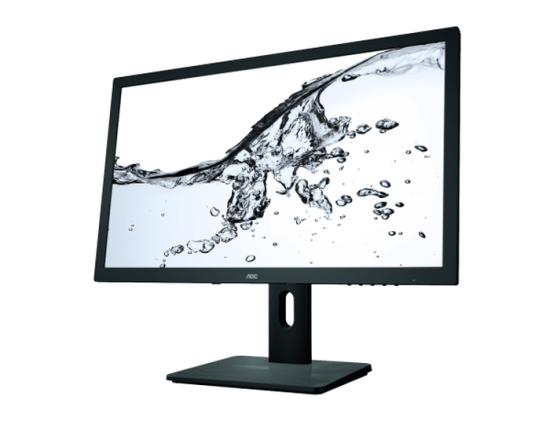 AOC’s new monitors of the 75 Series shine with their low energy consumption levels and are fully certified with a variety of ecolabels (e.g. EPA 6.0, TCO 6.0, EPEAT Gold). A hard power switch helps save even more energy when the displays are not in use. Another important aspect next to energy-efficiency is user health. An ergonomically friendly workplace is important to keep employees healthy and comfortable. All displays within the 75 Series are thus equipped with an array of ergonomic options that allow users to adjust the monitors to their individual needs. All 75P models are hereby fitted with height-adjustment, pivot, swivel and tilt functions. Each monitor’s usability is further increased by the integrated Flicker-Free technology that reduces flickering effects, which can frequently lead to the occurrence of eyestrain after long usage periods, particularly during office work. 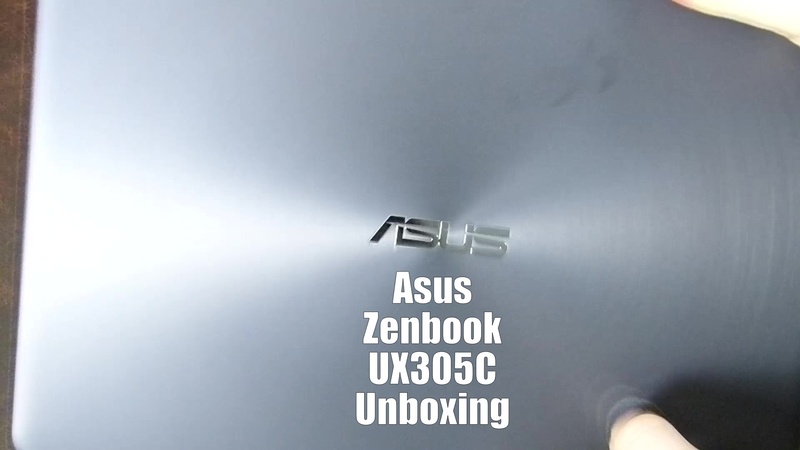 Asus have sent over their latest Zenbook model, the UX305C. 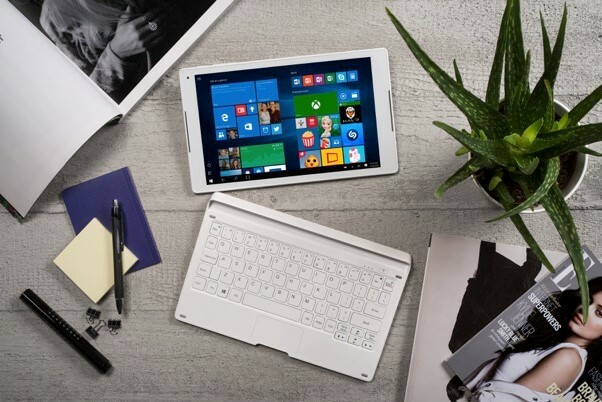 This super slim laptop is designed to work with the demands of a desktop whilst being ultra portable and uber stylish. 256 GB Solid State Drive. 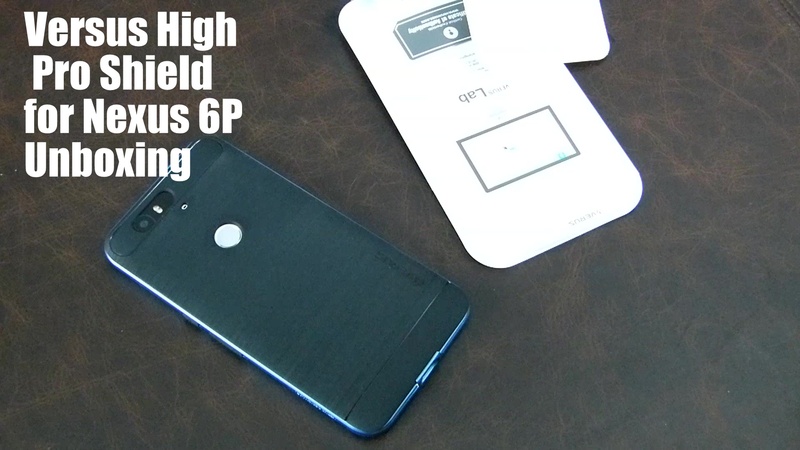 Equipped with dual-band WiFi 802.11N. 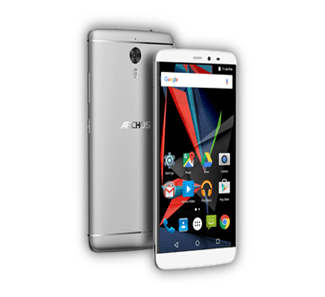 All harboured inside a an ultra-slim, all-aluminium body. During this year’s CeBIT, display specialist AOC invites you to take a look at its recent product innovations designed for B2C, B2B and gaming users alike. The manufacturer will showcase its diverse product line-up, including the recently released C3583FQ curved gaming monitor or 32″ widescreen 4K UHD display U3277PQU, at the booth of IT distributor api at Planet Reseller in hall 15 between 14 and 18 March 2016. 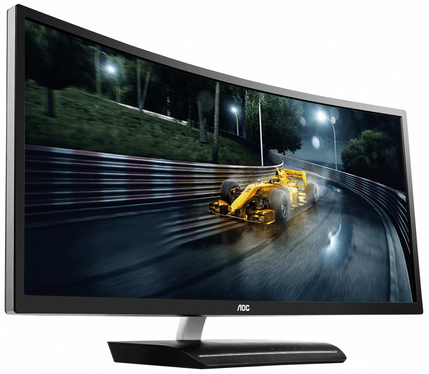 With its 2000 mm radius, the AOC C3583FQ is more curved than other conventional curved monitors and thus provides users with a fully immersive experience for games, streams, movies and more. It boasts an extremely fast refresh rate of 160 Hz, Adaptive-Sync technology (compatible with FreeSync™, with a 45 to 160 Hz range out of the box) and Wide Full HD resolution (2560 x 1080 pixels). Users can enjoy an ultra-smooth gaming experience without image tearing, stuttering, input lag or blur and further benefit from up-to-date connectivity standards including two HDMI (MHL) as well as DisplayPort inputs. The AOC U3277PQU boasts a 4K UHD resolution of 3840 x 2160 pixels, which is four times as much as a standard Full HD panel, therefore rendering photos, texts, videos, games and other content considerably sharper and more detailed. Intelligent features such as Picture-in-Picture or Picture-by-Picture allow users to view images from two different sources at the same time. High brightness levels, wide viewing angles and 100% coverage of the SRGB colour gamut (8-bit+FRC, 1 billion colours) create brilliant images that are appealing for home users and designers alike. 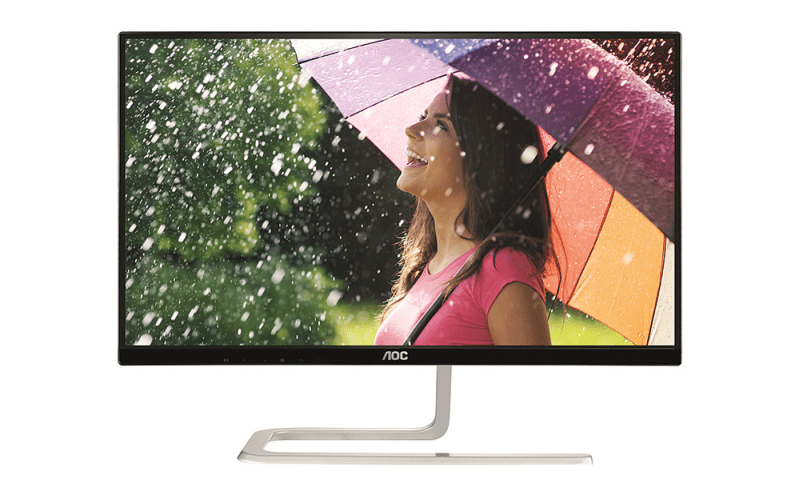 A stunning Quad HD resolution of 2560 x 1440 pixels and ample screen real-estate of 25″ make the AOC Q2577PWQ interesting for all professionals who rely on razor-sharp images. The display’s short response time of just 5 ms ensures fluid image reproduction, enabling players and movie fans to enjoy clear images even during fast-paced scenes. 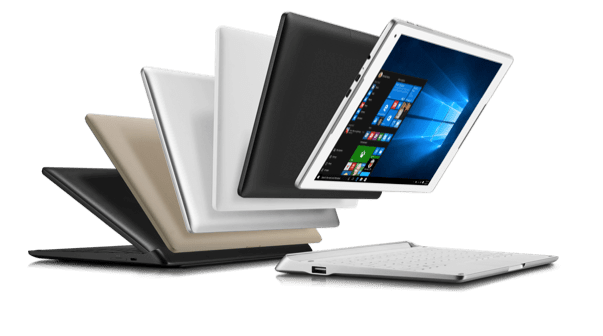 Features such as the integrated Flicker-FREE technology, which reduces eye-strain during long working periods, various ergonomic adjustment options and up-to-date connectivity turn the display into a versatile companion for every workspace. The AOC I2481FXH’s asymmetric metal stand and borderless frame turns the 23.8″ (60.5 cm) display into a real eye-catcher that furthermore impresses with brilliant images and wide viewing angles. 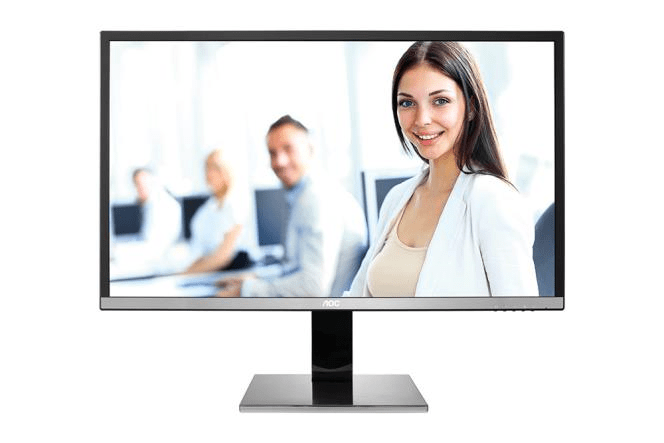 The monitor features an IPS panel with the Full HD resolution of 1920 x 1080 pixels and includes features such as Flicker-FREE technology to improve users’ viewing experiences. It can be connected to various devices thanks to its two HDMI connectors and VGA socket. 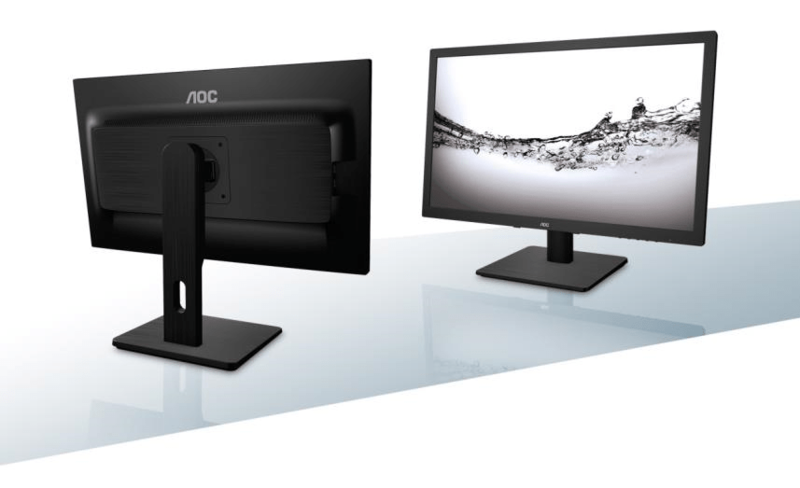 The AOC I2475PXQU (23.8”) and I2775PQU (27”) provide a glimpse of the new 75 series of professional monitors that AOC is releasing this year. Both monitors boast modern connectivity (HDMI, DisplayPort, USB 3.0) and diverse ergonomic features that make them especially suitable for professional users. The showcased models feature an integrated IPS panel with a resolution of 1920×1080 pixels, integrated speakers and are comprehensively certified.